Hindus software produces complete customized software, web application and mobile application for government and non-government companies. We carry 13 years experience in design, develop and maintaining IT products and services. As an IT developer we are developing Software applications, Mobile applications, Web applications. We also develop Device integrated software like Vehicle Tracking System, Point of Sale, Barcode System, Bio Enabled Face recognition system, online payment gateway system. For the software which has SMS facilities, we provide Bulk SMS to our clients. In website development we also provide Domain Registration and Hosting. We have very long term experience in developing software, website application for Corporation and Nagarpalikas (68 out of 159) of Gujarat. We are leading software and website application provider for Nagarpalika and corporation in Gujarat. We develop applications for Non-Government Clients also. We understand today’s dynamic market; product development requires innovation, creativity as well as speed to deliver. Our deal to clients is not only up to the implementation of product, but lifetime support for product maintenance also. Our system of product development is well planned. We follow lifecycle shown in image below to give complete and satisfactory solution to our client. Our development lifecycle is like – requirement gathering, analysis, designing, periodic discussion with client, development, testing, implementation, training and support for customization and requirement. Our technical team uses technology and domain experience and add value to product development. We setup and manage dedicated product development and support teams at our development centre for our clients and also project based development. 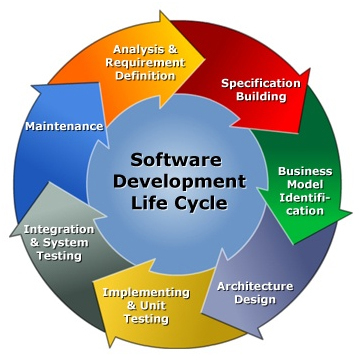 Our Technical expert team plans and executes Software Development Lifecycle within time and budget constraints. We analyze your business needs, determine the best technology fit and work with your team to develop the custom software. Application developed by Hindus Software give result to client in enhanced performance, improvement, efficient that clients feel satisfaction, realize leverage on their operating cost. Hindus Software as an IT Service Provider….. Complete and Perfect Understanding of Client’s Requirement. Deeply analysis of required system. Technically powerful and vast experienced staff. Use of current technologies like online complains registration, SMS for speed support. Mutual Understanding and Perfect communication among staff regarding work.